After independence the State of New York began to set in motion the aspects of its Constitution that made it governable. In an act of the legislature on March 7, 1788 each county in the State was divided into townships so their populations could elect officials to govern under municipal laws. The citizens of Kingston had already been governed for over a century by their elected Trustees in much the same way that they would have had the Corporation of Kingston been one of these towns. The Trustees oversaw schools, roads, safety and the poor as well as law enforcement and the courts. In other places in the Hudson valley tenants of manor land were governed by the lord of the manor who had similar responsibilities only he was not elected. Under the constitution of New York the special privileges of manors and corporations such as Kingston were denied and so along with the manors that surrounded it Kingston became a constitutional Town and ceased being a Corporate town. But the Corporation of Kingston essentially owned nearly all the land in the new “Town” and as a corporation remained governed, by law, by the twelve trustees annually elected by all the freeholders of the “commonality” of Kingston. The Trustees still continued to perform the duties of a town government alongside the government of the Town of Kingston after it was formed. Because the Trustee system had a long history of efficiently carrying out the responsibility of providing for the welfare of the "commonality" and overseeing the sharing of the commons and the maintenance of the roads that accessed them for several years the same people were elected to both offices. But in time the difference between the responsibilities that the Trustees undertook and the political power that they were in a position to control brought them into direct competition with those demanding a true Town of Kingston government. Eventually the Town replaced the services of the Trustees and the State called for the distribution of the Corporation’s assets. The breaking up of the Commons took years. A complete division was necessary, the common lands had to be sold and the treasury distributed. To do this the commons were mapped for the first time in over a century. The original patent had been expanded in the Saugerties Region many times during the 1700's. Thousands of acres had also been sold. The Town of Kingston was made up of all the lands deeded from the Kingston Patent, all of the other patents added to the jurisdiction of the Corporation over the past century and all of the lands held as Commons within the Kingston Patent. Division of the Commons meant a survey of the complete Town. Once the common lands were clearly distinguished from private lands as the "classes", the Trustees made their division. Each of the seventeen large class divisions was divided into smaller, numbered lots of 30 and 45-acre sizes that were laid out on a square grid. Finally, physical markers were placed on the corners of the lots. Within the logic of this division a character of the land took hold. From ages of use and familiarity with natural landmarks the geometry of the surveyor was merged with the geometry of the landforms to create the patterns of the markers of the first owners of this land. Most of the classes of the survey bear names that go back to the very first encounter with the land. The "South of Rondouts Kill" Class is self-explanatory. The "Clove" Class was adjacent to Hurley north of the City of Kingston. The "Suppies Hook" Class was the Ponckhockie and East Kingston areas. The Pine Bush” Class is the Kaleberg hills around Lake Katrine. The "Three Mile" Class was the Woodstock border around Zena. The "Binnewater" Class was around Sawkill. The "Flatbush" Class included the frontage along the River and up to the Saugerties border. The “Compensation Classes” that cover most of the western side of the present City of Kingston and the hills on the Hurley line get their name from being added to give land that would benefit the village dwellers unfamiliar with the assets of the countryside. The "First" Class bordered the Saugerties Region south of where the Plattekill meets the Esopus around Ruby. This naming represented even greater unfamiliarity with the even more remote land of the wilderness. The eight Classes of the Saugerties Region were the "2nd", "3rd", "4th", "5th", "6th", "7th", "Southwest" and "Northwest" Classes. Not a friendly name is found in their description. The Classes in Saugerties are mostly west of the Hoogeberg Ridge on the upper plateau and difficult to access. Of these numbered classes only the "Seventh" Class is not in this western area, but its position between the Hudson River and the Esopus Creek gorge separated from the plantation fields by the limestone ridges of the Kalkbergs between Turkey Point and the mouth of the Esopus allowed it also a feeling of remoteness to the center of population in old colonial Kingston. The "First Class" follows the base of the hills and continues up toward the mountains. The "Second" Class includes the territory along the Glasco Turnpike from Mount Marion to near John Joy Road. The "Third" Class is the Fish Creek and Pine Grove areas. The "Fourth" Class includes Veteran and Centerville. The "Fifth" Class takes in Blue Mountain and Quarryville. The "Sixth" Class is north of Quarryville between Asbury and Saxton. Saxton, parts of West Saugerties and all of the Blue Mountain Road are in the "Northwest" Class. The "Southwest" Class runs along the entire Saugerties-Woodstock border. The entire northwest area of the classes of the Kingston Commons division was involved in a period of flux as the county boundaries in New York State were being finalized. Kingston and Catskill were made into townships in 1788. Catskill was made up of all the land in Albany County from the township of Coxackie south to Kingston. Throughout the 1790’s the Corporation of Kingston litigated as the Trustees tried to define the northern boundary of Ulster County and the Kingston/Catskill border. On April 5, 1798 the legislature placed Catskill in Ulster County. At this time a boundary between the two towns was agreed upon: the lands between the Hudson and the Sawyerkill became part of Kingston and the lands north of a line run northwest from Wonton Island toward the Pine Orchard (North Lake) were in Catskill. Prior to 1788, Albany County included The Great Imboght district and Catskill within its borders with Imboght extended all the way down to the present village of Saugerties. This 1798 act placed the Great Imbogh and Catskill as one town into Ulster County just long enough for Greene county to be made out of Albany county by an Act of March 25, 1800. The bounds of the Town of Kingston and presumably the common lands that the Corporation of Kingston had been claiming since well before the Revolution then became the northern boundary of the County of Ulster once again fulfilling its patent's description from 1687. With the ancient dispute over the exact division between the original Ulster and Albany Counties that determined the northern extent of the Corporation of Kingston finally moot, in 1803 a survey of all overlapping claims in this northern area was filed with the legislature and the rights of the Corporation were recognized. By 1804 all of the Classes of the Corporation of Kingston had been mapped into parceled lots and a method of numbering their many locations was formalized. This is known as the Division of the Kingston Commons. With all the land from the Sawyerkill to the Hudson within Ulster County jurisdiction, by the survey of 1804 all land titles in Kingston were confirmed thus all titles can be traced to Class and Lot numbers in the Kingston Commons, to deeds from the Trustees made prior to the division, and to the small number of patents, mostly east and north of the Sawyerkill, issued while that land was a part of Albany County. The Trustees then began the politically charged task of transferring into private ownership lands that had been commonly used for generations. Lands in the Saugerties region had been mainly used for grazing and were transferred with the stipulation that fences be laid to keep animals from straying. The earliest lots were enclosed with the most available material: stone. These stone walls formed in the land the grid of the division map with their straight lines perpendicular to and parallel to the wall of the Catskill escarpment; south sixty-six degrees east and south twenty-four degrees east. As these boundaries went up they had a special meaning to those that had used the commons for generations. They were not so much a container for property as a marker. The process that made them was one of completing a duty committing the land to the memory of those generations that came before. The right to purchase had been reserved first to those whose families had lived longest on the commons and had the deepest tradition of respect for the land. There was a spiritual connection between the way these stone walls pointed toward the mountain wall and navigated their way out parallel to it and on to the Hudson. Every one of these lots came with a common right to access. Wording was standardized on the deeds to recognize the customs that had been followed in the commons. Most of those purchasing private ownership had always worked under this understanding. This open right of “trespass” for all owners of lots was the same custom that always allowed any freeholder passage. Roads had early formed along the ridge lines of the bluestone ledges. The ledges paralleled the Catskill wall. Their high ground location made them passable in wet weather but also reserved the best watered lower grassland for grazing. These north-south roads were only narrow herding paths so they did not impose much on the lots they crossed. The east-west roads and those that followed diagonal courses were wider and most of the lots they crossed were left unnumbered on the division map to remain mutually owned as the commercial routes to and from the lots and beyond into the mountains. The development potential of these east-west roads as turnpikes became one of the earliest concerns of the Trustees. They attracted the interest of speculators. By 1804 the Ulster and Delaware Turnpike had already climbed over the Catskill Mountains and the legislature had approved the establishment of a corporation to build an extension from its end on the Susquehanna 160 additional miles into the interior of the state. The traffic this would add to the tidewater destinations on the Hudson River promised substantial growth in business for the Town of Kingston. Within the next few years three routes were created to feed off the Ulster and Delaware Turnpike to ports on the Hudson in Saugerties. Over the same period the business interests of the Saugerties region worked to influence the legislature to have a separate town made of this region. On April 8, 1811 the Town of Saugerties was incorporated. In the Kingston Commons, which by 1783 was nearly a century old, the citizens of Saugerties had been freely charting their own course and working toward their own prosperity for generations. Their prosperity was directly related to advantages only available in this unique place. The Saugerties of 1783 was largely commons. What this means is that much of the land of Saugerties was not privately owned but owned in common by all of the landholders of Kingston. As such, they only had to maintain and bear the expense of a comparatively small piece of land to produce an enormously bountiful harvest. This was done by simply expanding their fields and pasturage seasonally into the commons. The commons were treated like the plains of the Western United States would later be treated by the ranchers before the fences of the farmers arrived. The commons of Saugerties would not see fences until after 1804. A typical farm in Saugerties would apply all of its cleared land to the plow for a cash crop of corn and winter wheat. These fields were near the farmhouse and protected from wild animals. The farmsteads with their barns and herding pens were located close to the edge of the hills above which most of the land was commons. A large herd of cattle used for dairy products would be taken into the commons daily. Sheep were also grazed on its slopes. Pigs roamed the commons freely and were gathered at the end of he season once they were fat on chestnuts and acorns. The dairy products were cheese and butter and were sold at the landings on the Hudson to be taken to New York on the sloops. Throughout the year cordwood was cut and shipped for the fireplaces of New York. The stone farmhouses that were expanded and newly built in this period following Independence show that the farmers of Saugerties were as prosperous as the village dwellers of Kingston. Kingston had been rebuilt in this same period and much of the style and application of the architecture of both places is similar. This period of growth based on an agrarian economy took Saugerties to a level of population and commerce that soon placed demands on the lands available for economic expansion. Not only river commerce was added to its agricultural base but also mercantile interests and some infant attempts at manufacturing beyond agricultural support were beginning to spring up. All of these activities were limited by restrictions on business and commerce allowed by law within the Kingston Commons. The Trustees controlled the resources of the commons to support the needs of the freeholders of Kingston. Business activities unrelated to agricultural or supporting the growth of a workforce unrelated to the large plantations of Kingston were discouraged by official land use policies. The centralized mercantile control of Kingston Village based on, in addition to Kingston, the agriculture of the Rondout and Esopus valleys and their centers in New Paltz and Hurley used these policies to limit competitive growth from Saugerties’ focus on river commerce. Hudson, Catskill and Athens were becoming commercial centers to the north of Saugerties. Poughkeepsie was also expanding its influence on the shipping trade of the Hudson River. In the midst of this aggressive competitive activity the Trustees stubbornly maintained the farming focus of Kingston and its inland village character. That survey of 1803 was in two phases. The first mapped all the documented claims of the Corporation of Kingston to firm up the exact bounds of the Town of Kingston. Land had been added to the original patent description of 1687 over the preceding century. This survey was to place the northern border that had extended with these additions into what was then Albany County. Once this border was settled on, this line became the boundary between the towns of Kingston and Catskill. This also became the line dividing the new Greene County from the extended Ulster County. All of this newly defined Town of Kingston up to the new Greene county border was claimed by the Corporation of Kingston. The second phase of the 1803 survey divided this total town of Kingston into a grid of mostly 30 & 45 acre lots. Locating these lots was made manageable by placing them in large divisions called "Classes". The classes are located on this study placing them on the 1893 USGS topographical map. Its list is linked to the spreadsheet of deeds to numbered and unnumbered lots in each class. A half dozen of these classes are south of the Rondout Creek in the present town of Esopus. These were, by name: The South of Rondout Second Class East of Road; the South of Rondout Second Class South of Road: South of Rondout First Class; The Huzzy Hill lots; The Shappawanick Mountain lots; Kline Esopus lots. Nine of these Classes were around the present day City of Kingston and Towns of Ulster and a much-decreased Town of Kingston. These were, by name: The Binnewater Class; The Pine Bush Class; The Flat Bush Class; The Clove Class; The Three Mile Class; Compensation Class East of Road; Compensation Class West of Road; and, the Suppies Hook lots. Parts of the Southwest and most of the First Class were also in these towns. The rest were in Saugerties. 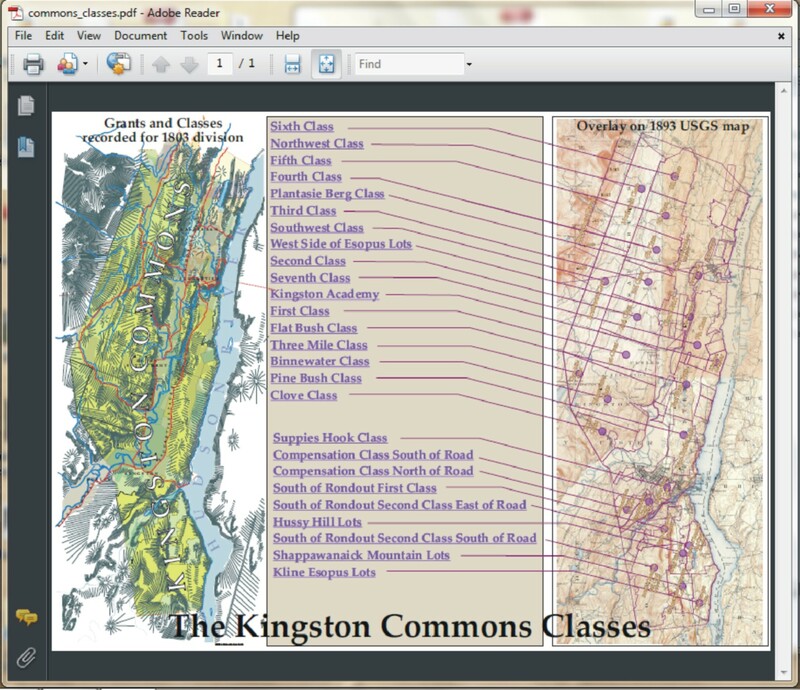 80% of present day Saugerties is on the footprint of part or all of 11 "Kingston Common Classes". These are, by name: most of the Southwest Class and the northernmost line of lots in the First Class; all of the Second, Third, Forth, Fifth, Sixth, Northwest, Seventh, Plantasie Bergh ; and, the West of the Esopus Kill lots. There are also occupied farms within and adjacent to Class bounds that use numbered lot corners or lines as references for their locations. In excess of 650 individual deeds to these lots are recorded in what are called the "Trustees Books" numbered 1, 2, 3, 4, 5, 6, 7, and 8. The latter four of these books are made up of printed "boilerplate" deeds with hand written date, purchaser and trustees' name, lot description and reservation of trespass rights to common access. All of Books 5 and 6 and most of 7 are deeds recorded in 1804 with books 1, 2, 3, 4 and the rest of 7 and the J, K and L parts of book 8 recording deeds that range in time from 1687 to the last sale in 1816. The Trustees books have an Index but this is by grantee name only. The original survey maps are missing and a map made in the 1890's by Edward Codwise that is much referenced but missing parts and very schematic in form, has been found to be incomplete and in many cases erroneous. Surveyors like Codwise have attempted to reconstruct the 1803 surveys for specific areas of interest but the only evidence of extensive research to locate exact positions of lot corners relative to a large collection of period surveys to be found is in the collected documents of Morris Rosenblum. Rebuilding an accurate map of the original surveys is not a completely onerous task. Every deed is a building block rectangle and each references corners of others in its description. Nearly all descriptions use right angle directions of 66° SE or NW and 24° NE or SW. All the deed descriptions are written in measurements of “chains and links” and use specific numbered lots as corners as well. The town of Saugerties provides the key to the precise locating of every Commons lot that has a location on the west side of the fields of Atharacton, the Churchland and Kaatsbaan. The locations east of this and on the river and also south of the Roundout do not have this "key" advantage. The originating 1811 documentation for the formation of Saugerties applies the 66 and 24-degree angles and uses "chains" as a measure in its boundary description. This description also uses a specific Kingston Commons lot as a corner. That makes it possible to use any modern day map of Saugerties to position the angles and measurements of the original commons lots. The town's west to south corner gives both the key angle and position of a starting point. A scaling key is even made possible by dividing the length of the sides of this key southwest angle into the number of chains in the 1811 formation documentation. From there it is possible to correctly proportion and position a model lot rectangle size to the overall map since all the deeds use adjacent lots in their descriptions. Even the odd lot description with non-rectangular measurements can be drafted to fill a void by applying this 1803 base angle to plot a shape. The majority of Morris Rosenblum's work on Kingston Commons lots is concerned with Saugerties but his collection of survey references covers the entire Kingston Patent. His own personal studies use graph paper and overlays of vellum to draw lots and link them together to reproduce Classes. This is done over a number of years as clues appear in surveys and title abstracts. His Classes sketches at first were scaled to accurately place the Commons Lots in registry on aerial survey photographs and then after 1978, when tax lot maps registered to the USGS topographical map of the town were made, the scale of these became his base. A completely accurate Commons Lot registry would follow a process that filled vertical and horizontal columns and rows stretching from the bottom of the town to the top and from the west bounds eastward beginning at the southwest key point. Proportionally drawing each and placing each in position next to the other as building blocks creates a precise historical "base map". The first thing this base map would accomplish is to verify that the proportions of the individual Commons lots match the overall scale of the town map of Saugerties. Once this is shown to be reasonably accurate a similar building process to locate the rest of the Commons Lots in the Classes to the south would have these fall in place. An historical Commons map aligned with the USGS map would match the earth. Its alignment to tax lots to match their originating documentation is another story. The overall tax map of the town is not considered to be precise. Aligning property boundaries to an historical base was something of a challenge to Morris Rosenblum as an attorney who dealt with forensic evidence to resolve controversy. It is obvious when the proportion of the historical base of the Commons is overlaid that adjacent lots and internal divisions have to be adjusted proportionately to match. Alignment to topographical features such as stream banks and roadsides in property descriptions and property surveys based on such landmarks have resulted in inaccuracies compared to the historical precision the original Commons surveys allow. In essence there are two property maps. One is the 1803 survey that is the historical base. When this is matched to USGS topographical features its lines can accurately be found today using GIS location. The other is the tax lot map of current property divisions based on surveys that have deviated in one form or the other from what is historically accurate. A typical surveyed land has no larger scale orientation for placing it, save a road or waterway. The whole of the Kingston Commons is a template that should make finding any early or present day property's location dead accurate. To historians, lawyers and surveyors this template is the ultimate benefit of mapping the Commons. There are many other benefits of knowing about the Commons that are not as controversial as the location of property lines. Most early deeds use the names of those owning adjacent property as their bounds. The names are also included on survey drawings. A quick look at a real estate or tax lean notice in a late 19th century newspaper shows that both the Commons lot and class and the bounds ownership methods were used to describe and locate a property. The Commons are not used for such descriptions into the beginning of the twentieth century and essentially disappear from drawings by the 1980's. This language in those ancient deeds and leases today offers many insights into the composition of the community of the day. The fact that Kingston Commons lots were sold based on a graduated scale depending on the length of residency in the Corporation of Kingston is of great historical value. There is a genealogical importance to these lot sales because they can be traced to individuals and their post and pre-Revolution residences. This adds a method for tracing lineage into this early period for individuals that may not have fallen into the normal records. These original trustees deeds are treasure troves of geographical information also. The place names and descriptions of physical and historical features that work their way into the descriptions written into the originating Kingston Commons deeds are of great interest. Even the variations of spelling of the same familiar word, described by a Dutch speaker as opposed to a decidedly English surname gives an idea of the genesis of the current words in use today. The fact that so many of these descriptions were written in the short period of five weeks between January and March in 1804 implies that many inhabitants concurred on place names and their locations. For instance, when present day Wilhelm Road is consistently described as Blue Mountain Road in every deed that uses it as a boundary that is not only what everyone called it in 1804 but it indicates that was the main road used to get to Blue Mountain for those that lived there. And, when a schoolhouse and a spring are excluded from a deed which is simply described as "under the blue mountain" and adjoining both the 4th and 5th classes the only place on the map this can be is at the old Blue Mountain school on what we now call Blue Mountain Road. Logically then, Willhelm Road to High Falls Road to Fawn Road and on to this schoolhouse location along either present day Blue Mountain Road or VanVlierden Road was a thoroughfare in 1804. Being able to go to a book from its reference on this map of the Commons and find there the earliest written account of land features and even houses, schools and mills has obvious advantages. But, aside from the discovery of names and features, the Commons shed light on the movement of property lines throughout history. When tax maps were first made available there were plenty of holes left between surveyed properties. Long before this town-wide reference the lore among professionals was that surveying from the south needed different points of origin than from the north. The same east from west. Overlaps and gaps were often resolved at a convenient middle ground. This is what would be evidenced in the mismatches between a map of the Commons and the comparatively imprecise tax map that is compiled from recorded surveys. If a grid based on the ancient lines of the Commons division was available to those generating the first tax maps they would have been more accurate and less of a problem to surveyors. It is amazing that the Kingston Commons division scheme of 1803 was not used as the root for every subsequent transfer after 1816. This is one of the few places in the United States where this can be done and bragging rights about the preciseness of the division of its land could have been as much a part of its heritage as any other part of its history. In the 19th century 90% of the map features recognizable today in the region of the Kingston Commons took form. In 1804 the northern border of the Kingston Commons became the southern boundary of the newly created Greene County. In 1811 the towns of Saugerties and Esopus were separated from Kingston. The erection of Saugerties as a town put a combination of commons lot boundaries and watercourses as borders into the record, demanding a precise placement for these as locations on all future maps. Because of this, proprietary divisions initiated with the survey for the Kingston Commons are most identifiable in Saugerties. The "2nd", "3rd", "4th", "5th", "6th", "7th", "Southwest" and "Northwest" Classes of this division define the land mass of the town west of the Hoogeberg Ridge on the upper plateau and all of it between the Hudson River and the Esopus Creek from Turkey Point to the mouth of the Esopus. The "Second" Class includes the territory along the Glasco Turnpike from Mount Marion to near John Joy Road. The "Third" Class is the Fish Creek and Pine Grove areas. The "Fourth" Class includes Veteran and Centerville. The "Fifth" Class takes in Blue Mountain and Quarryville. The "Sixth" Class is everything north of Quarryville between Asbury and Saxton. Saxton, parts of West Saugerties and all of the Blue Mountain Road are in the "Northwest" Class. The "Southwest" Class runs along the entire Saugerties-Woodstock border. The “Seventh” Class and neighboring lots on the west shore of the Esopus Creek covers South Saugerties, Glasco and Flatbush; everything along routes 9W and 32. The survey for the division of the commons confirms the original places of large pre-revolution farms within its grid and it is the ancient deeds and patents to these early locations that give names like Churchland, Kaatsbaan, Dutch Settlement, Pine Grove, Flatbush, Plattekill, and Blue Mountain to later maps. With the sale of the Kingston Commons as a grid of 30 and 45 acre lots the land gained topographic features from the stone walls that enclosed them, and roads that followed their boundaries, all running perpendicular to and parallel to the great face of the Catskill Mountains. This permanently set the twenty-two and sixty-six degree orientation for all lots in every class of the Kingston Commons with its relationship forever fixed to what the natives called “the great wall of Maniteau”. By the time the U. S. Geological Survey was revising its early 1893 topographic maps, turnpikes built in the 1820’s that crossed Saugerties bringing materials from its heart to the Hudson River were already being planned as automobile roads to mountain recreation destinations. But this earliest of geographical maps is a lasting record of a land with a long history of 18th and 19th century habitation. Much of this land that was once rugged hills and rushing streams had changed over this time. The early industrial revolution factories of Saugerties raised the Esopus behind a great dam in 1826 and by 1889 dredging for their industrial traffic raised the expansive Esopus shoals a mile into the Hudson river for the man-made land that now flanks the channel to the Saugerties lighthouse. The greatest change resulted from the quarrying of bluestone. Between 1832 when this industry was founded and the early 20th century entire hillsides were chipped away in two-inch-thick slabs for the sidewalks of the major cities of the era. Between the lowering of the hills where the bluestone was quarried and the spreading of the shoreline of the Hudson River with waste from the finishing at the docks the quarrying made changes in the ancient lands of the Kingston Commons that distributed the mass of its long recognizable landscape in a way that the great glaciers had failed to achieve eons before. Today a peculiar lay of the land incised on the earth by man is clear on the digital aerial views of Google Earth and Bing Virtual Earth. This sums up the influence that the presence of the geological land forms had had on on man since the first one arrived over 10,000 years ago. Modern man, since the mid-nineteenth century, has only emphasized what the spirit of the land had there all along.